Modern comfort and design harmonizes with traditional Fijian warmth and culture at this upscale beachfront resort. 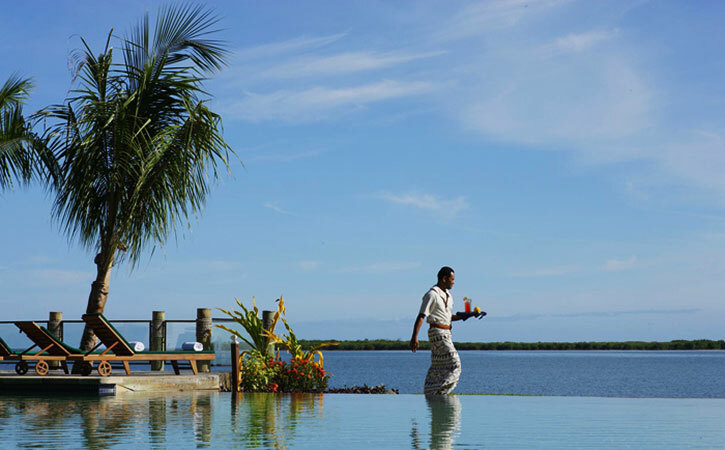 Stunningly situated on picturesque Denarau Island, enjoy breathtaking views of Nadi Bay, some of Fiji’s most acclaimed restaurants, a rejuvenating world-class spa, 18-hole golf course, and a broad range of exciting activities. Port Denarau, the gateway to the Mamanuca and Yasawa Islands, is just five minutes away and accessible by complimentary shuttle. Only a 20-minute drive from Nadi airport, this tropical sanctuary is also an ideal choice for pre- and post- overnight stays. 273 stylishly furnished guest rooms all feature the Heavenly® Bed, Heavenly Shower®, private balcony or patio, air conditioning, flat screen TV and high-speed internet access. Deluxe Rooms and suites feature a DVD player and surround sound system. Rollaway beds are available at an additional cost of FJ$35.00 per night. Garden View Rooms - Located on ground floor with private patio and views of the lush gardens. King or twin beds. Designed for 2 guests, but can fit 3 with rollaway bed. Deluxe Garden View Rooms offer private balcony and surround sound system. Ocean View Rooms - Located on ground floor with private patio and views of the ocean. King or twin beds. Designed for 2 guests, but can fit 3 with rollaway bed. Deluxe Ocean View Rooms offer private balcony and surround sound system. Ocean Front Rooms - Located on ground floor with private patio and direct access to the beach. King or twin beds. Designed for 2 guests, but can fit 3 with rollaway bed.. Deluxe Ocean Front Rooms offer private balcony, DVD player, and surround sound system. Suites - Luxuriously appointed Regency and Royalty Suites feature a large private balcony with ocean views, master bedroom and bathroom with free-standing bathtub, separate dining and living area, work office, pantry, guest bathroom, surround sound and DVD player. Designed for 2 guests, but can fit 3 with rollaway bed. Oceanfront suites are also available. WestinWORKOUT® Rooms - Work out in the privacy of your room. Features a treadmill, dumbbells, fitness library, Runner's World maps to guide you around Denarau, and complimentary bottled water. Designed for 2 guests, but can fit 3 with rollaway bed. Ask us about our current specials at Westin Denarau Island Resort & Spa!